When the TARDIS is invaded by a holographic marketing scam, the Doctor and Donna find themselves trapped on the Edifice, a purpose-built complex of luxury apartments in space. Their new environs leave much to be desired: millions of beings from across the Universe have been gathered to live side by side in similar apartments. Instead of creating neighbourly affection, it's led to terrible battles being waged in the corridors and on the stairwells. The Doctor and Donna must cross the paths of deadly alien mobs as they search for the Edifice's ultimate authority. Who - or what - lies at the heart of the incredible complex? What destructive scourge is eating away at the Edifice itself? And are the Doctor and Donna trapped forever in this living hell? Doctor Who: The Forever Trap features the Doctor and Donna, as played by David Tennant and Catherine Tate in the hit BBC Television series Doctor Who. 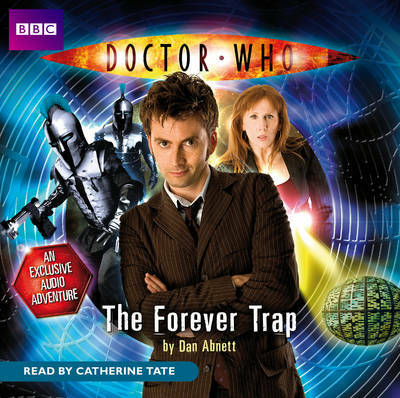 Written specially for audio by Dan Abnett, it is read by Catherine Tate. 2 CDs. 2 hrs 21 mins. This is a great audiobook!